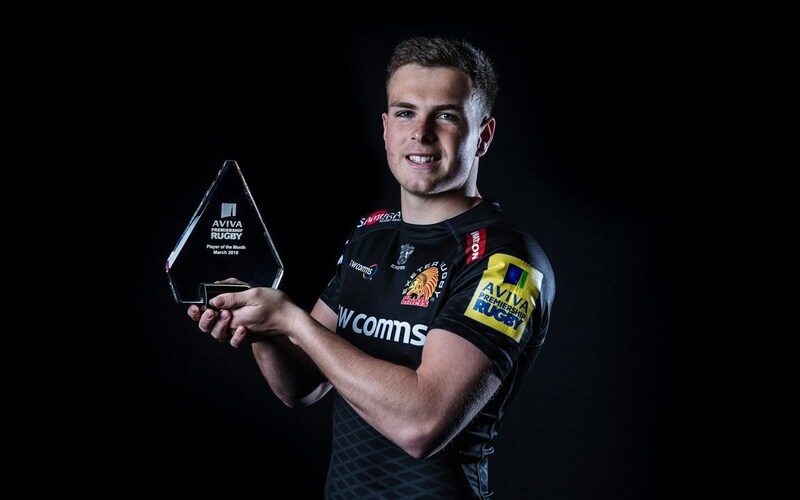 ExeterChiefs outside-half Joe Simmonds has today been named Aviva Premiership Rugby Player of the Month for March 2018. Simmonds made a big impact for the Chiefs in March, instrumental in crucial wins over Saracens and Bath, leaving his club at the top of the Aviva Premiership Rugby table. Simmonds was judged by a panel of experts as the player who made the biggest impact in the League over the month March. He was involved in a four-way battle for the latest title, eventually beating Sale Sharks scrum-half Faf de Klerk, Gloucester Rugby centre Henry Trinder and Leicester Tigers full-back Telusa Veaniu to the title. Simmonds was voted for by a panel of media professionals based on his performances in November – Nick Mullins (BT Sport), Alastair Eykyn (BT Sport), Mick Cleary (The Daily Telegraph), Sarah Mockford (Rugby World), Jonny Fordham (The Sun), Jill Douglas (ITV Sport), Chris Jones (BBC 5 Live), David Rogers (Getty Images) and Tom Hamilton (ESPN). The panel was chaired by Paul Morgan, Premiership Rugby’s Communications Director. Simmonds wins a trophy and a £250 donation to the charity of his choice.